The Orebed Brook Trail remains closed, due to a landslide. Photo by Brendan Wiltse. Most trails in the eastern High Peaks are now open, but state officials warn that hikers may encounter blowdown and erosion and find that footbridges are missing. “Hikers must pay close attention as there are reroutes and also a lot of new eroded drainages that people may assume are the trail,” said David Winchell, a spokesman for the state Department of Environmental Conservation. One of the reroutes is below Marcy Dam on the Van Hoevenberg Trail, the most popular trail to Mount Marcy. The floods caused by Hurricane Irene washed out the bridge at the dam. For now, hikers will to rock-hop to cross the brook below the dam. Winchell warned that the brook may be impassable in high water, “which we are currently experiencing.” When water is high, hikers should take the Marcy Dam Truck Trail, which follows the opposite side of the brook. From there, hikers can continue to Mount Marcy, Avalanche Pass, and other backcountry destinations. DEC has made no decisions on whether to replace the bridge and repair the dam, Winchell added. Irene damaged the dam’s flashboards, causing water levels to drop and exposing mudflats in the pond behind the dam. Hikers will also find that the plank walkways along Avalanche Lake have been damaged, but Winchell said they remain usable. 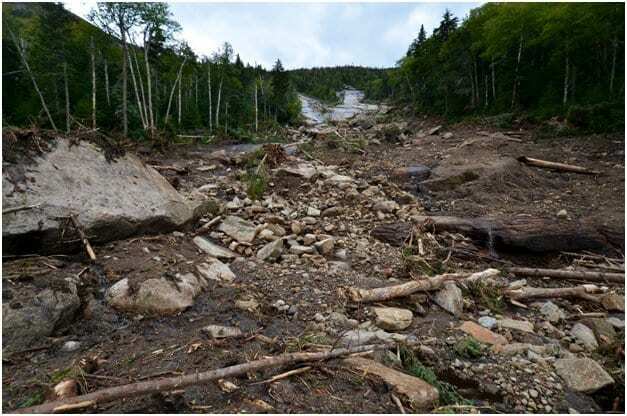 DEC closed the eastern High Peaks, the Giant Mountain Wilderness, and the Dix Mountain Wilderness the day after Irene dumped about ten inches of rain in the region, eroding trails, washing away footbridges, triggering landslides, and damaging roads. 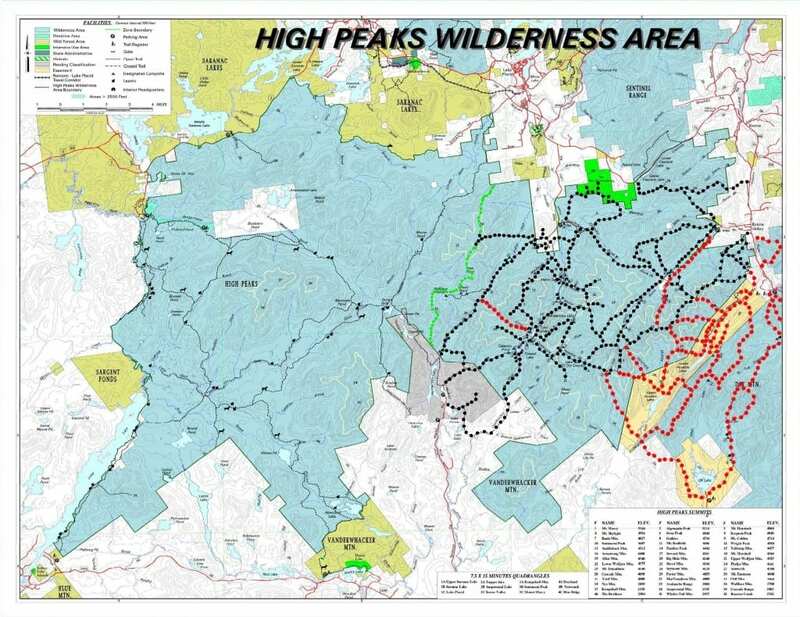 DEC has focused on opening trails in the eastern High Peaks, in part because the partial closure of Route 73 means that most trailheads for the Giant and Dix Wilderness Areas are inaccessible. John Million, deputy director of the Adirondack Mountain Club, commended DEC for its efforts. “ADK is very pleased that DEC has worked hard to open some of the trails,” he said. ADK reopened today both Adirondak Loj, the most popular trailhead for the High Peaks, and Johns Brook Lodge, which is located in the interior of the Wilderness Area. A short section of the road to the Loj will have only one lane open, owing to storm damage. A one-lane bridge on the way to the Garden, the parking area for the trail to Johns Brook Lodge, also was damaged in the storm. DEC is now saying the road will be closed this weekend. A shuttle bus will bring hikers from Marcy Field to Keene Valley, where they must hike 1.25 miles to the Garden. The map below was provided by DEC, but we modified it to clearly show which trails have been reopened and which remain closed. The trails marked by red dots are closed. Those marked by black dots were closed but have been reopened. All other trails (marked by black dashes) were never closed. The green dots indicate the boundary between the eastern High Peaks and western High Peaks. The latter was not closed after the storm. Two of the trails in the eastern High Peaks that remain closed are the Orebed Brook Trail from Johns Brook Lodge to the col between Gothics and Saddleback and the Southside Trail along Johns Brook. Parts of both trails have been buried by landslides. The rains set off numerous large slides in the High Peaks that some hikers will be eager to climb. Winchell said DEC has not closed any of the slides, but he warned that some may be unstable. Winchell was not sure why the Cold Brook Pass Trail remains closed, but he said it may be a combination of blowdown or landslides. This little-used trail runs from the Indian Pass Trail to Lake Colden. The Deer Brook Trail to Snow Mountain remains closed because of blowdown. 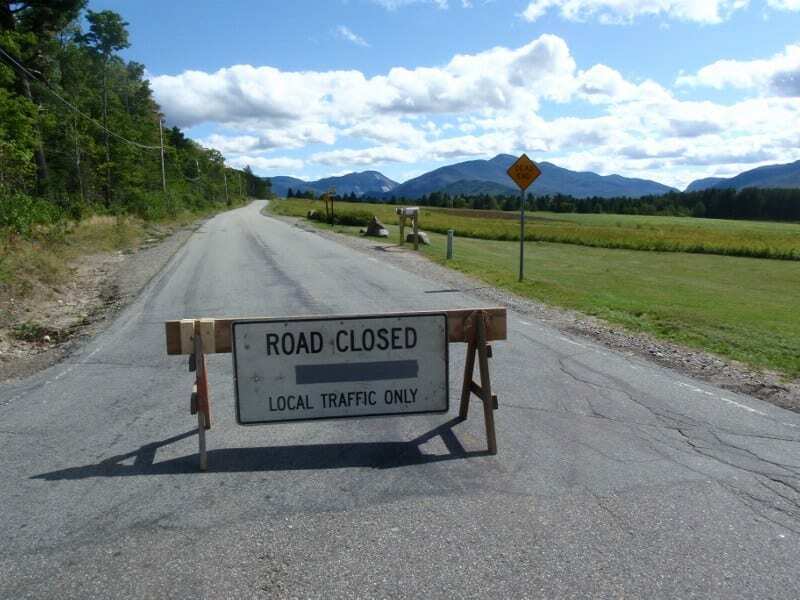 The trails leading from the Adirondack Mountain Reserve to the southeast slopes of the Great Range also remain closed. Because of the partial closure of Route 73, all AMR trailheads are inaccessible. Route 73 is closed between Route 9 and Keene Valley. As a result, the Ridge Trail and Roaring Brook Trail up Giant Mountain and the Round Pond Trail up Dix Mountain are still closed. Governor Andrew Cuomo vowed this week that Route 73 would reopen by September 15. 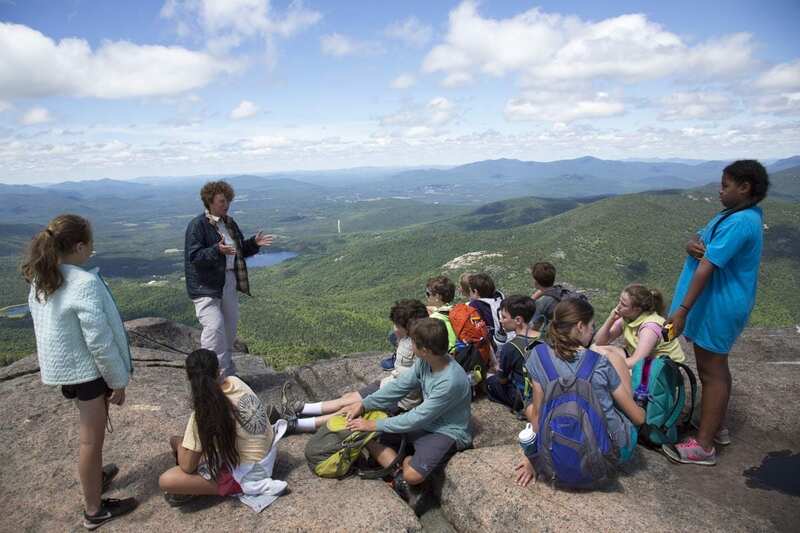 Meantime, hikers can use the trails in the Giant Mountain Wilderness that begin on Route 9 or Route 9N. The Elk Lake trailheads are also closed. Click the link below to read a PDF of DEC’s bulletin on the trails, which I received late this morning (after my initial post). Although the bulletin says the Wolf Jaw Trail is closed from Johns Brook valley to the Range Trail, this is not reflected on the map. I checked with DEC and was told the trail is open. Trails marked in red remain closed. All others are open. Map courtesy of DEC. This is really good news, not just for hikers but for the communities like Keene and Keene Valley as well. Thanks again Phil for all of your timely, informative updates. I amended the post to reflect an announcement from DEC that the hikers will not be able to drive to the Garden this weekend after all. I also appended DEC’s own advisory on the overall trails situation, which I got after I uploaded my post. Jeff, I only partially agree. It may be good for Keene and Keene Valley but the folks that hike in these conditions better not try and pretend that they care at all about the environment. Is this really the best way to protect the environment? For the folks that want to rush back up there it is all about recreation and nothing is going to stand in the way of that. Do folks really think that Forest Preserve land is well protected. “Forever Wild”? What a joke. Paul, the Adirondack Mountain Club and the Adirondack 46ers are both very strong advocates of Leave No Trace principles. I beleive most hikers and wilderness users make every attempt to follow those principles. The DEC advisory from the Almanack refers to “avoiding damage to trails” as opposed to damage to the environment. Historically, DEC has only closed access to state lands in extreme cases. Those closures were the right thing to do following Irene, but re-opening access now is also the right thing to do. Jeff, You are kidding right? have you ever been on some of these trails. These areas are getting totally destroyed and opening trails under these conditions will speed the destructive process. Feel free to go and hike up there but don’t pretend that these folks care about the environment. If they did they would take a break and let the area recover. What they care about is maximum time on the trail. Jeff, why do you think that trails on the Ausable Club land are closed? Because they care about them and the surrounding terrain. Like you said in one of your recent blogs this is an area where they have “well-maintained trails through some of the most beautiful old-growth forest in all of the High Peaks.”. They are doing the “right thing” I am not so sure I would say that about what is going on in these other areas that clearly don’t seem even be close to being ready to sustain heavy use. For example how could any of these hastily construed re-routes be well designed? Paul, you seem to be characterizing hikers as selfish and uncaring towards the environment. I think that’s unfair, and in my experience just the opposite is true. We could debate the impact hikers have on the environment, along with the underlying causes and possible solutions, but that’s really a separate (and valid) question. The bottom line is that NYS DEC has the responsibility for balancing access to these lands with public safety and resource protection. They have evaluated the conditions and determined that it is appropriate to open these areas at this time. That’s a good thing for everyone. As for the Ausable Club and AMR, those trails are not re-opening yet due to the continued closure of Route 73 and damage to the hikers’ parking area there. I am not aware of any other reasons for those closures. My friends and I are planning on camping at Paradox Lake Campground this weekend and heading up to climb Giant Mt early tomorrow morning. Does anyone know if the trailhead/trail in New Russia for Giant Mt is open and, if so, any recommended routes? Also, our original plan was to climb Mt. Marcy, but given the road closure of Rt 73, we were told it would take an extra hr to get to our destination at Wilmington Notch (coming from 87 N in Poughkeepsie, NY). Do you guys know if the detour indeed would add another hr to our trip to Wilmingon Notch? The New Russia Trailhead is on Route 9 and so is open. The trail leads over a number of nice summits to Rocky Peak Ridge, one of the High Peaks. From there you can get to Giant. It’s a long round trip, with a lot of elevation gain. If you don’t want to do the whole thing, Bald Peak is a good destination part way up the trail. The Route 73 detour will add about 15 miles to your trip. You get off at Exit 31 instead of Exit 30. Use your instincts people. If your mind says yes and your instincts say no what do you think the result will be? Footing is uncertain, ground still settling. There are trails which are not in the high peaks which have not suffered damage which are hikable and enjoyable. Use them for one week. Here is a better weekend. Unify against hyro fracking world wide. Start a group or a rally. Contruct an e-mail of every congressman WHO vote to deregulate up to 80% of all felderally protected forests INCLUDING the GIANTS of california who have been alive for 3500 years.